Martha Berry expresses interest in making a return visit to Dr. J. H. Kellogg's Battle Creek Sanitarium. Kellogg will be delighted for Berry to visit Battle Creek. 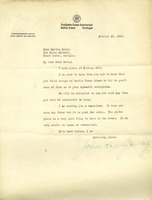 Martha Berry expresses appreciation to John Harvey Kellogg (transposing his initials in the address) for his invitation to the Battle Creek Sanitarium. Note from Martha Berry to Miss Bonner concerning a black satin dress lined with tan fur and tulle around the neck. Wants the dress sent to Virginia Fuller to fix. Written on the reverse of Battle Creek Sanatorium stationery. Martha Berry asks Miss Bonner to send a receipt for the enclosed check from Miss Potter. She suggests that Miss Bonner go to Asheville for a few days, and instructs her to "tell Mama to take nurse & go to Mentone". Berry provides information about her travel plans, stating that she will leave Tuesday for Mt. Kisco. 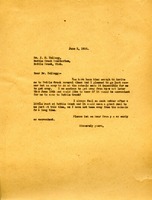 She asks for an address for Mrs. Whiting. She is apparently in residence at the Battle Creek Sanitarium, where she wishes she could stay a month. 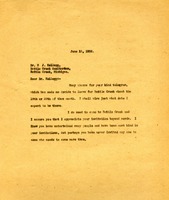 Berry sends instructions to Bonner, including having her send pictures, literature, and movies to her in Battle Creek. Mr. Kellogg expresses his delight at hearing that Miss Berry tried to graft some of Battle Creek Sanitarium's ideas onto her schools. He also sends Miss Berry a vaporizer to help with colds. 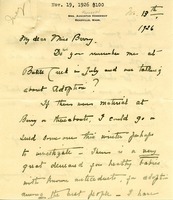 Hemenway inquires about the availability of babies for adoption, telling Berry that there is great demand for healthy babies with "known antecedents." She reports that she successfully placed six babies over the summer.